Hi guys! 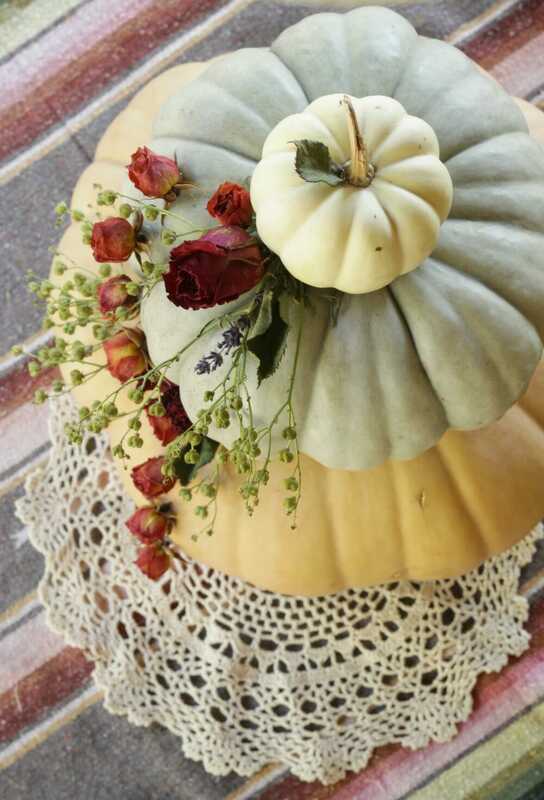 Today I am back with my Creative DIY team of Brenda, Susan, and Cristina and we are bringing you 4 pretty pumpkin projects, including my dried floral tiered pumpkin centerpiece. 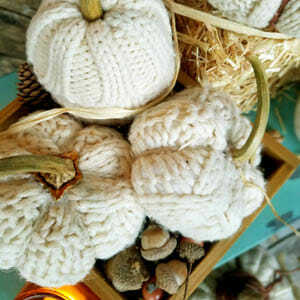 I am really drawn to pumpkins and gourds just as they are in their natural beauty and I wanted to keep my fall decor on the more natural side this year, using things that I had in my yard or on hand. So when the Creative DIY Team chose to do a pumpkin project this month, I was quite honestly stumped at first. 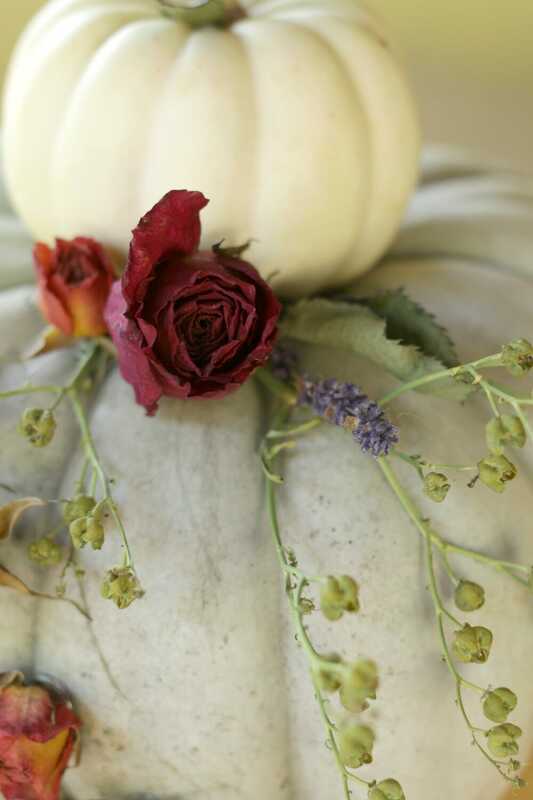 What could I do with already beautiful pumpkins in muted colors? 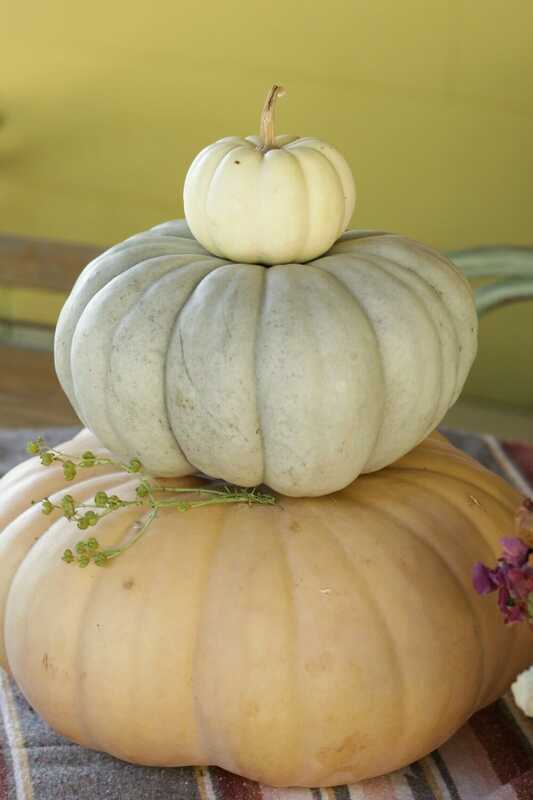 I placed the largest pumpkin which had very little stem on the bottom and stacked a small cinderella pumpkin on top. 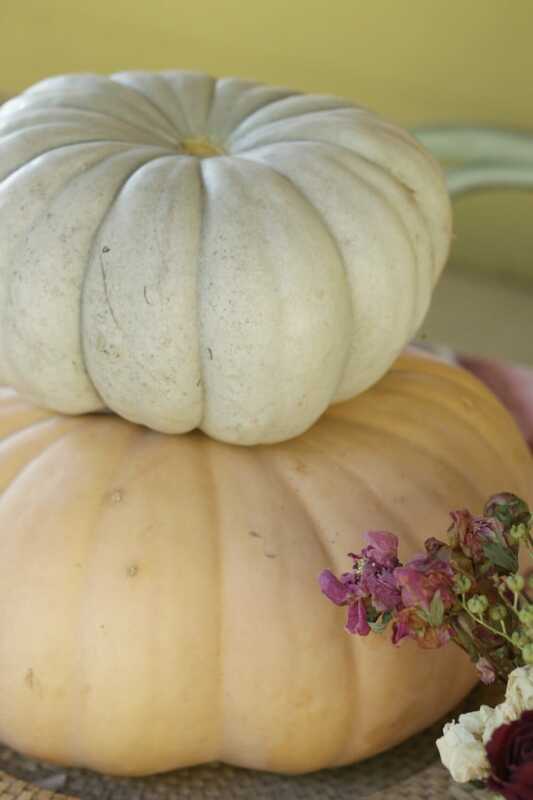 I snapped the stem from the cinderella pumpkin so another gourd could rest there. 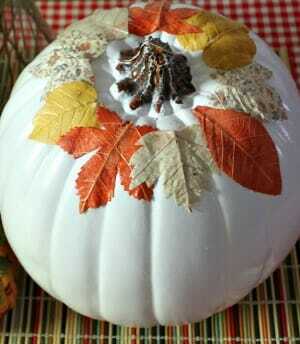 Next I added a little mini white pumpkin to the top, and kept its stem in place. I then started hot gluing my rue in place, just a few sprays, and keeping the floral design to one side of the display. The rue was the base layer, and I knew the flowers would cover where I had glued its stem in place. 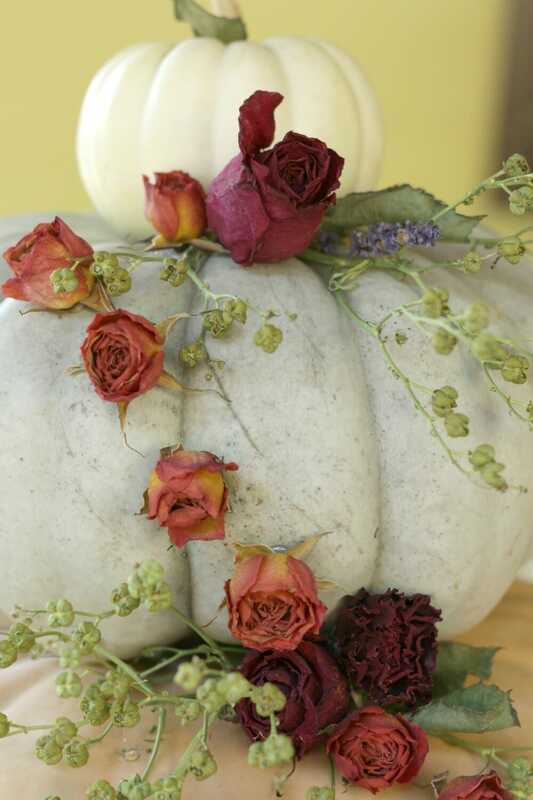 After I added all of my rue, I began adding roses (the red ones from the garden) to my pumpkins. 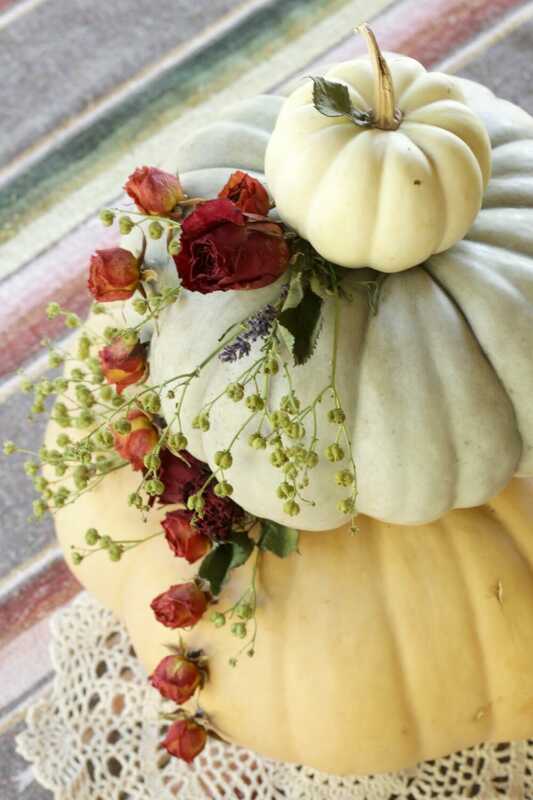 To the top of the pumpkin display, I added a little stem of lavender just to bring in that nice purple color for fall. I always love plums and eggplant in the fall! Next, I cut just the lovely coral-pink buds off the arrangement that was a gift. 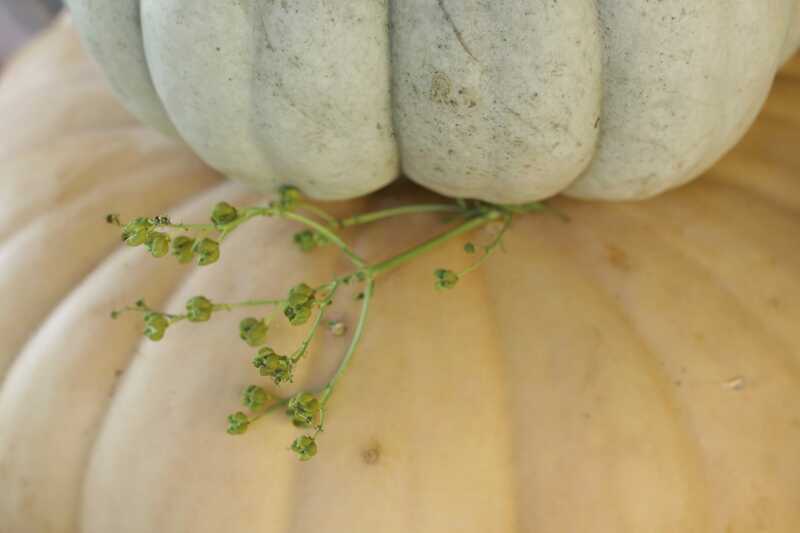 I arranged them in a cascading manner down the sides of the pumpkins. 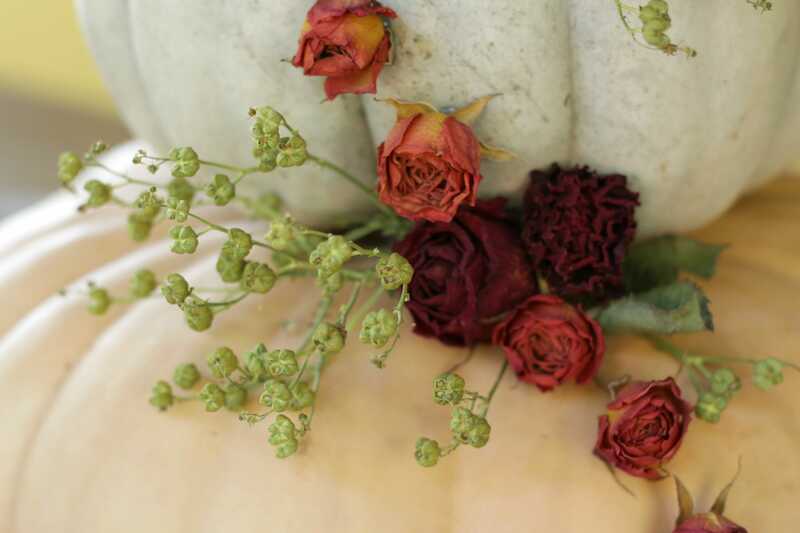 As you can see I also used some of the dried rose leaves and glued them into the arrangement to add another element of greenery. 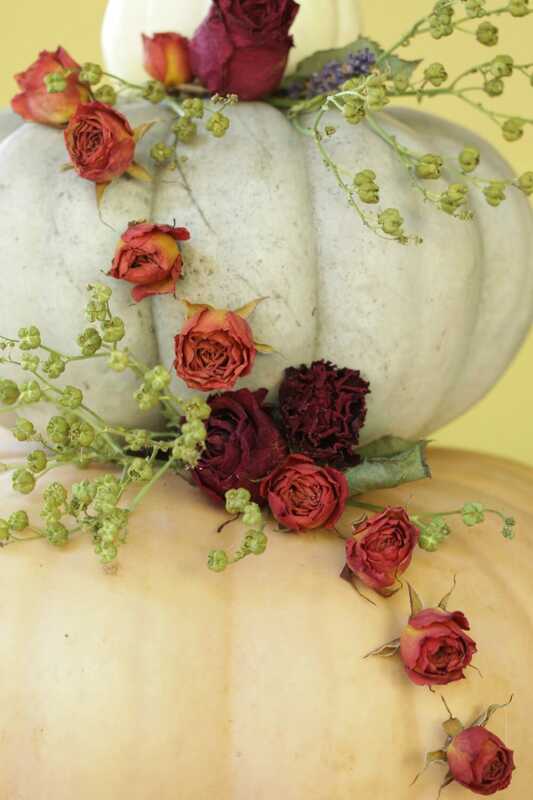 I even added a little rose leaf to the mini pumpkin at the top. 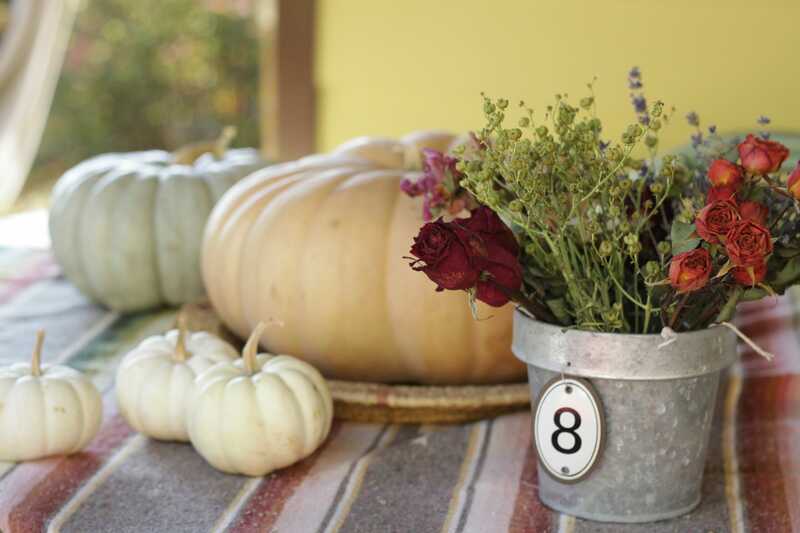 After I created this natural fall display, I changed up the porch table, using this as the new centerpiece. Emmy is hoping to have a couple of friends over for breakfast on the porch this weekend if weather permits, and I think the girls will like this fun and feminine pumpkin display. And I personally love being able to create with natural elements! 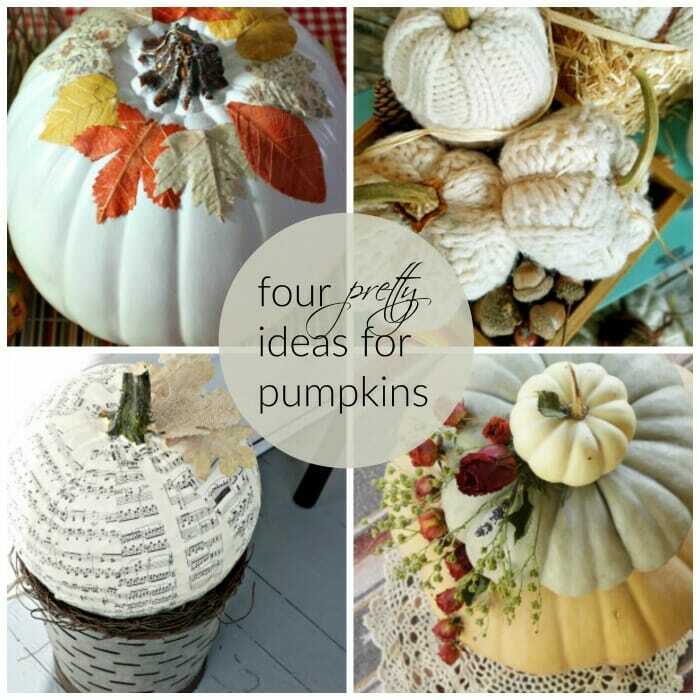 Now head on over to checkout the other ladies’ pretty pumpkin projects! I will see you here tomorrow for some Thrift Score Thursday action! cassie, i love how this looks. 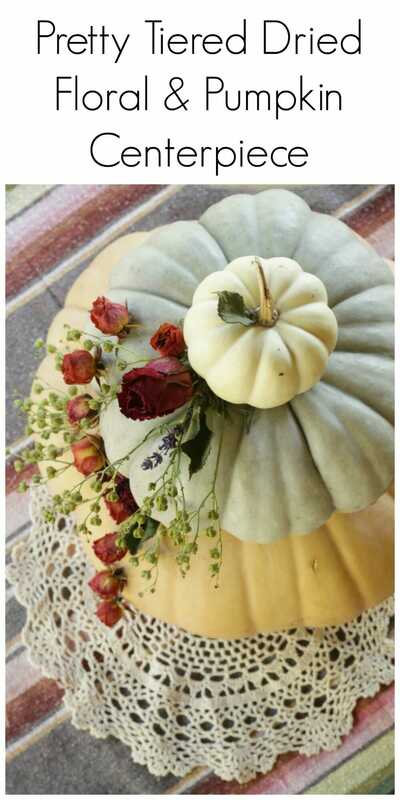 the mix of the pumpkins and the dried florals is a nice change and will last longer then fresh flowers. Cassie, you just outdid yourself with this one! It’s so so pretty and different! I love the shades in the flowers! Such beautiful colours. Cassie, it’s simply beautiful! You’ve made Mother Nature proud. thank you so much, brenda! i hope so! It’s beautiful, Cassie! The dried flowers are so pretty. I hope the weather stays nice for Emmy! Cassie, I love what you did. So soft and pretty and I love the addition of the doily underneath!! gorgeous, lady!!! 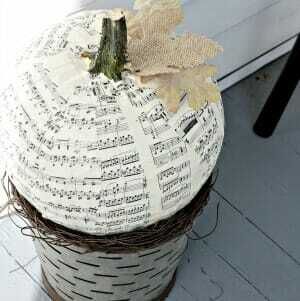 exactly the type of fall decor I could see in my house! Love this super cute trio you did Cassie! Perfect! Absolutely beautiful Cassie!! The dried flowers were the perfect additions and makes it so romantic! How cool is that?!!! I love how your creative mind works. aaaw, right back at ya! Beautiful! You are so creative! I love this! Very pretty, Cassie, and unique with the not-orange pumpkins and the botanicals.